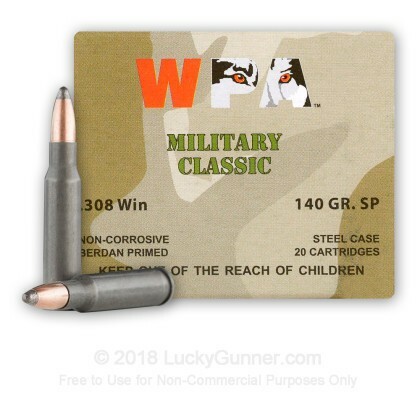 This .308 Winchester ammunition from Wolf fires soft point ammunition ideal for hunting deer and other midsize game. Soft point projectiles have a semi-jacketed lead core that expands into a mushroom shape when it strikes a target at high velocities, delivering a lethal blow to the animal without fragmenting and damaging meat or trophies. Each cartridge in this box of 20 fires a 140 grain projectile. This ammo is loaded in Russia and uses non-corrosive Berdan primers and non-reloadable steel cases. 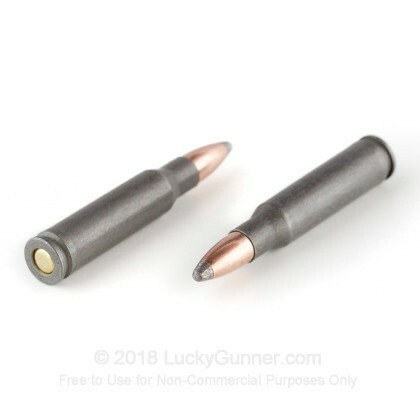 Steel-cased ammunition is a great deal for shooters who don't handload their ammo. It is typically polymer coated for improved cycling and costs significantly less than brass-cased ammo due to the relatively low cost of iron ore. 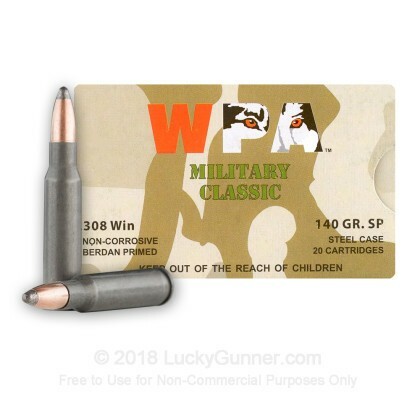 This is some great ammo and a great price. I don't know about autos but in a bolt action there deadly. I plan to get more. O. D.